TURF CUTTING IS taking place in Roscommon and Galway despite an EU directive prohibiting cutting on certain bogs, with cutters saying that they are vindicating their rights. Deputy Luke ‘Ming’ Flanagan, the PRO for the Turf Cutters and Contractors Association (TCCA), told TheJournal.ie that he has been at the Monivea bog near Athenry since 7am this morning. He said there has been a heavy garda presence, with gardaí approaching the cutters to tell them what they are doing is prohibited. Deputy Flanagan said that there are six machines cutting the bog and they anticipate the cutting to go on for the next 24 hours, with 150 people gathered at the site. Cutting is also taking place in Roscommon. Flanagan said that that the cutters are “vindicating our rights” and that if government wants to bring more turf cutters to court, “we will fight it through the courts and fight it politically and fight it on the bogs”. The deputy said there was a “great irony” in that fact that “those bankers [from the recently released Anglo tapes] are tucked up in their five star beds at the moment and turf cutters here are facing the possibility of three years in jail”. 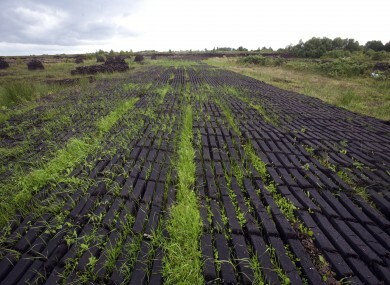 The Department of Arts and Heritage have been in talks with turf cutters over a European Union directive that requires member states to conserve peatland habitats on raised bogs. The directive has meant that the government has had to enforce a total ban on turf-cutting on certain bogs. Flanagan said that a turf cutter can heat their home and cook their food for €300 a year “and that is not something to be sniffed at”, and “what they are being offered as an alternative is a pittance”. They were offered the option in some cases to move to another bog, but no other bogs have been found by the State. He said that “people are taking a stand on this” and that “people are just going to stand our ground and keep cutting”. Flanagan said that turf cutters have shown a willingness to cooperate and have “got nothing back from government”, so the cutting is “the only practical thing we can do”. There is believed to be another standoff at a bog in Kilteevan in Roscommon over the same issue, and also involving gardaí. In Galway, Flanagan said gardaí are warning people about the rules around turf cutting. A garda spokesperson said that so far there have been no arrests and incidents. Deputy Flanagan said the gardaí “have been very reasonable” and deserve credit for the way they have handled the situation so far. When asked why a lawmaker such as himself would be a lawbreaker, he said he is sticking to his election promise and that of everyone who ran in the local area – adding that at that time (11.30am) he was the only local political figure present. A statement from the Department of Arts, Heritage and the Gaeltacht said that a flexible package of compensation for turf cutters affected by the designations is in place. This package includes a number of options for turf cutters including financial compensation, or the provision of a relocation bog for cutting turf where that is possible with the option of the financial payment or the delivery of turf while awaiting relocation. It said that turf-cutters can apply for a payment of €1,500 euro each year for 15 years, along with a sign-up payment of €500 when legal agreements are signed. This brings the total available financial compensation package to €23,000, index linked and tax free. Compensation payments made under the scheme total around €4 million. More than 2,700 payments of €1,500 each have been made to applicants under the scheme and approximately 2,500 tonnes of turf have also been delivered to turf cutters at a cost of €316,000. It added that “intensive work is ongoing to find suitable relocation bogs”. Killeranny in Offaly is a relocation bog which is now being used by turf cutters who were previously cutting on Clara Bog, and 23 turf cutters have been accommodated here. Arrangements for the relocation of turf cutters to non-designated bogs have been made for a group of turf cutters from Carrownagappul Bog and Curraghlehanagh Bog in County Galway. Potential relocation sites have been identified for a further 33 bogs and work is ongoing on identifying and investigating sites. According to the department, “relocation is unlikely to be required, or is likely to be small-scale, for another 16 raised bog special areas of conservation”. Email “Turf cutters 'vindicate their rights' and cut turf in Roscommon and Galway ”. Feedback on “Turf cutters 'vindicate their rights' and cut turf in Roscommon and Galway ”.